After entering or confirming the values on the previous dialogs a final dialog is displayed to highlight any obvious issues and allow a final confirmation of details before the install commences. 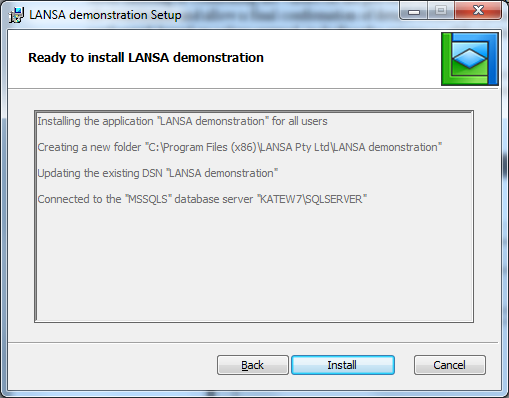 Several checks are performed, based on values entered, including the existence of the installation location and DSN and a check to ensure the database server can be accessed. If any validation fails the Install button will be disabled preventing the installation from continuing. Review the text information and use the Back button to return through the dialogs to correct any values, or modify the external environment to rectify any issues. Press Install to start the installation process.